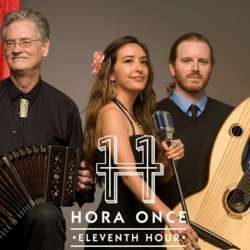 Hora Once plays Nuevo and Classical Tango, Latin folk music, and world music. The band features Colombian singer and songwriter, Ana Barajas, with guitar, harp, accordion, and bandoneon accompaniment. The first set (6:30 PM) will be a dance performance by Gustavo Simplis, Mónica Caivano, and other dancers from Esquina Tango. During the break there will be a free beginner's tango lesson hosted by Esquina Tango. The second set (8 PM) will be open dancing. Admission is free.